Making 'Falun Red' traditional Swedish paint - Falu rödfärg! 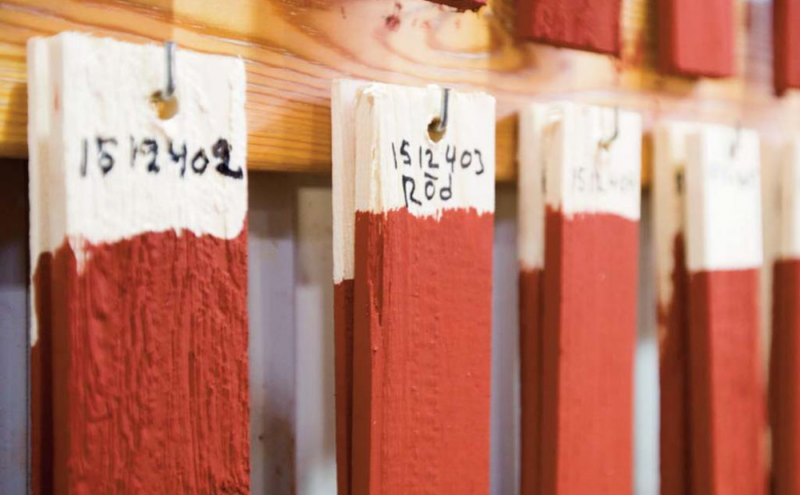 Making ‘Falun Red’ traditional Swedish paint – Falu rödfärg! So we’re building one nearer to home. We want to have it in distinctive the distinctive red oxide paint…but modern paints available in UK/Ireland have too much crap in them. So we asked our good friend and artist Åsa Fridén as she lives in one such ‘Falun Red’ house in SW Sweden. Åsa studied with us at University several eons ago. and here is how you make it – compared to most modern exterior wood paints this is MUCH healthier. Also a wonderful natural preservative for wood. Here are the steps on how to make Falu rödfärg! 1. Dissolve 2 kilos of iron sulfate in 50 litres of boiling water. 2. Add 2-2,5 kilos of finely ground rye flour while stirring, almost whipping, to blend the flour properly. Leave to boil for 15 minutes, stir now and then. 3. Add 8 kilos of red pigment while stirring rapidly. 4. Leave to simmer on low heat for 30 minutes. The paint is ready to use as soon as it has cooled down and will last to cover 150-180 square metres, depending on the surface. This paint sticks better on roughly cut boards. It’s also important to make sure that the fibres of the boards are facing downwards, so that water won’t be caught in the fibres and sucked into the boards.